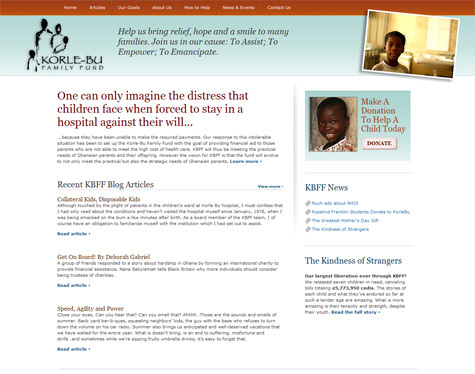 Korle-Bu Family Fund exists to provide financial and material support for needy children admitted to the Pediatric Unit of Korle Bu Hospital in Accra, Ghana. Currently about 30-45% of all (discharged) newborns and infants who receive care at the hospital are detained by the hospital’s administration and staff until their fees are paid in full. As a result, the various children’s wards remain overcrowded and understaffed resulting in poor levels of personal attention for each patient. The Korle Bu Family Fund has been set up to meet the practical needs of impoverished Ghanaian parents and their children. Like most of the developing world, Ghana does not have a national health service or health insurance which means that payment for any health service received must be paid in cash at the time of need. This has led to an abominable situation where sometimes people needing medical help are refused medical assistance until they have made payment. The situation is even more distressing because of the manner in which the cash payment system is affecting children. When parents are unable to meet the cost of healthcare for their children, these children are effectively detained by the hospital until the required payment has been made. One can imagine the distress that children as well as their parents will face when forced to stay in hospital against their will because they have been unable to make the required payments. Our response to this intolerable situation has been to set up KBFF with the goal of providing financial aid to those parents who are not able to meet the high cost of healthcare in core. KBFF will thus be meeting the practical needs of Ghanaian parents and their offspring. However the vision for KBFF is that the fund will evolve to not only meet the practical but also the strategic needs of Ghanaian parents. The root cause of the abominable situation in which we now find ourselves is poverty. Parents are unable to pay for the healthcare costs of their children simply because they lack the money to do so. It is not the intention of KBFF to become a dependency tool for Ghanaian parents. Rather, we hope to see KBFF evolving into a social enterprise which will be able to provide employment opportunities and wealth creation for impoverished Ghanaians.